Brian is enjoying his success on winning the Best Pie in Furness competition on Abbey FM. 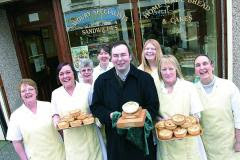 Here he is posing with some of his staff outside one his bakery shops in Barrow-in-Furness holding the Golden Pie Award. Don't the other pies look delicious? And I can say with personal experience that they taste delicious too! Brian was also photographed in the North-West Evening Mail. I don't have a copy of the photo, but it is available to view (and buy) by clicking here. Brian is making the most of his success by advertising on Abbey FM - click the "play" button on the toolbar below to hear his ad - makes your mouth water!